1. Apply one coat of white paint (Ugly Duckling Schmelt It) and cure in an LED light for 45 seconds or UV light for two minutes. Apply a very thin second coat. Do not cure. 2. 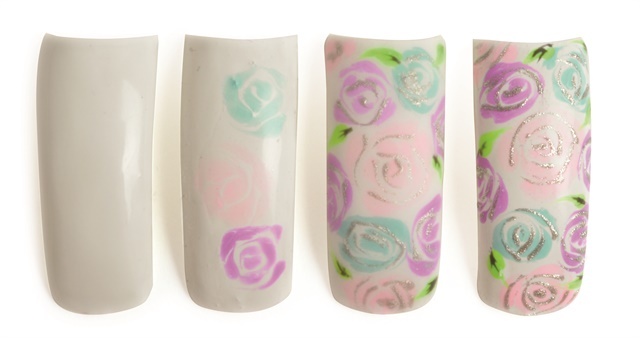 Using a Bio Sculpture Upper Arch brush, paint roses in Luxio Attraction, Engagement, and Delightful. Apply the gel-polish lightly to allow the colors to melt. 4. Finish with Luxio Matte-On.